$3.49 to $224.99 & FREE Shipping on orders over $59 $35. Time to replace brewhouse tubing. Hanging my Water filter. This will allow my to run water to my kettles. Exactly what I was looking for. High Temp tubing at 1/2" ID, Food grade. Deal of the day and it never hurts to have a little extra around. Need bulk tubing for mare lavage. Cheaper to buy long piece and cut into sections and add adapters myself. My system requires lots of tubing. You can always use more hose. To get my order to free shipping amount. So I can pump hot water up to my HLT. I like this product. I use it for transferring hot water and wort. Best Tubing for building a homebrew system! I love this stuff. It is a great product, I would recommend to everybody! Seems like good tubing. I’m using for something probably no one else has ever used for but I think going to work fine. My only complaint which isn’t a big deal it it arrived very dirty. I had to wash first anyway so no big deal. A decent hose, a little thinner than I thought it would be, expected a firmer hose but it works fine. Don't go on amazon or somewhere else. 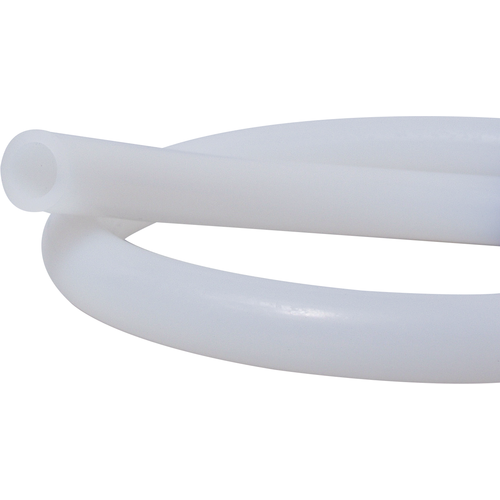 This is the silicone tubing you want. This is high quality and good to work with. It can - over time - yellow or stain with use, but easy to clean and handle. Not like some of the cheaper versions on there that just claim to be "1/2 diameter" and "silicone." Not all products are created equal. Buy this one. A great product. So happy with our purchases that we order from Moorbeer. What a great invention. Using several pieces in my setup for moving hot liquid around, both by gravity flow and also under a pump (MKII). Its been at least 6 months now and these are great. Also easy to cut. I ordered mine as one really long piece and then cut it to sizes myself. I think it was a kitchen knife that happened to be handy -- easy peasy. Used this as the tubing for my recirculating immersion chiller setup. High quality and easy to handle. Very good quality, very flexable. When it was time to replace my home-brew hot tubing i replaced all of my vinyl (low temp) tubing at the same time. The silicone tubing is so much easier to work with. I don't know why I didn't do this earlier. Anybody doing home-brew with vinyl should do the same.